Current Status: merged with John Abbot Lodge to form John Abbot-Samuel Crocker Lawrence Lodge, 10/02/2001. Now a part of Mystic Valley Lodge. Mystic Valley Lodge merged here, 06/28/1979. Regranted a dispensation to meet in 2009; charter re-granted 11/29/2010 by Grand Master Pageau. By Worshipful Bernard L. Cook. On Thursday evening, June 24, 1920, a group of 46 Masons met in the Masonic Apartments of Mount Hermon Lodge, which at that time was located on the second floor, above the old Boston and Maine Railroad Station on Main Street at Medford Square. The presiding Master of Mount Hermon Lodge, Wor. Burton Guy Ellis, presided at this meeting until Rt. Wor. Charles B. Dunham, Master of Mount Hermon Lodge in 1906 and 1907, was elected to be the first Master of the new Lodge. The new Lodge was named in memory of Samuel Crocker Lawrence. The minutes of that meeting stated that General Samuel Crocker Lawrence was one of Medford's most distinguished sons and one who had been found worthy to receive all the honors of Freemasonry that could be bestowed by the Craft in the United States of America. The Masonic reputation of General Lawrence was international and he was recognized as having gathered together the finest Masonic Library in the world at that time. On Tuesday, November 9, 1920, a meeting of the Charter Members was held in the Masonic Apartments for the purpose of Institution of Samuel Crocker Lawrence Lodge. Rt. Wor. Charles H. Miles, District Deputy Grand Master of the Sixth Masonic District, assisted by Wor. Arthur D. Stone, District Deputy Grand Marshal, performed the service of Institution by installing Rt. Wor. Charles B. Dunham as Master of Samuel Crocker Lawence Lodge and similarly installing the other officers. The first Communication of Samuel Crocker Lawrence Lodge, U. D. (Under Dispensation) was held on Tuesday, December 14, 1920. The first work performed by the officers of the Lodge was to confer the Entered Apprentice Degree upon four candidates, George Lewis Batchelder, Jr., Albert Walter Swenson, Charles Durant Coe, and Irvin Littlefield Smith. The ninth communication of Samuel Crocker Lawrence Lodge was held on Wednesday, June 22, 1921, for the purpose of Constitution of Samuel Crocker Lawrence Lodge. Most Worshipful Arthur D. Prince, Grand Master of Masons in Massachusetts, accompanied by his Suite of Grand Lodge Officers, was received by the Lodge. The Most Worshipful Grand Master performed the ceremony of Constitution of Samuel Crocker Lawrence Lodge. Following this, the Most Worshipful Grand Master installed Rt. Wor. Charles B. Dunham as Master. The remaining officers were installed by various other officers of the Grand Lodge. The minutes of the twentieth Communication of Samuel Crocker Lawrence Lodge, May 9, 1922, record that a gift of a gavel, Warden's Truncheons and a Marshal's baton to Samuel Crocker Lawrence Lodge from the Mystic Royal Arch Chapter was presented by Brother Charles H. Phinney, Junior Deacon of Samuel Crocker Lawrence Lodge, who at that time was serving as Excellent High Priest of the Chapter. rently used upon the altar of Samuel Crocker Lawrence Lodge. and other paraphernalia from Mrs. Samuel Crocker Lawrence. No mention is made of the individual items; however, the Deacons' and Stewards' rods with the silver tips engraved as a gift from Mrs. Samuel Crocker Lawrence, are presently in use in the Lodge. The sixty-first Communication of Samuel Crocker Lawrence Lodge was held on November 17, 1925 in the new Masonic Hall at 24 High Street. This meeting is of interest because this month marked the fifth anniversary of the Institution of Samuel Crocker Lawrence Lodge. This was Past Masters' Night and Rt. Wor. Charles B. Dunham was invited to assume the East to officiate in the work of the evening. The minutes of that Meeting stated that as well as having been the first Master of Samuel Crocker Lawrence Lodge, Rt. Wor. Bro. Dunham was also architect of the new Masonic Hall. The Lodge was very proud of the fact that its first Master wrought in Operative as well as Speculative Masonry, and had wrought for himself so splendid a monument. Samuel Crocker Lawrence Lodge has always been an active and a friendly Lodge. Many of its members have been well known in Medford in civic, community, business and church activities. The officers and members deserve commendation for their contributions of work for the betterment of the Lodge. It is impossible to credit each individual for his effort, but the following are those who have served Masonry either by many years of service as an officer or have served the Grand Lodge of Massachusetts beyond the portals of Samuel Crocker Lawrence Lodge. The first Master of Samuel Crocker Lawrence Lodge, R.W. Charles B. Dunham, was District Deputy Grand Master of the Sixth Masonic District in 1908, many years before the Institution of our Lodge. The second Master of Samuel Crocker Lawrence Lodge, R. W. Fred L. Moses, who was presiding Master of Soley Lodge at the time of the Institution of our Lodge, served as District Deputy Grand Master for the Sixth Masonic District in 1923 and 1924. (Assisting him as District Deputy Grand Marshal was Wor. Edward B. Ladd of Soley Lodge and as District Deputy Grand Secretary, Wor. Charles E. Cole of Soley Lodge.) R. W. Bro. Moses later served in 1927 as Junior Grand Warden of the Grand Lodge of Massachusetts. 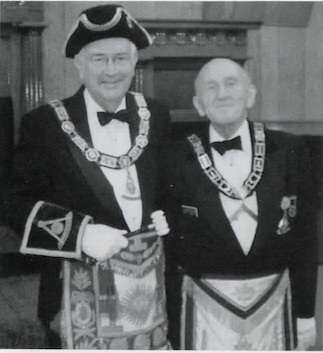 Samuel Crocker Lawrence Lodge was again honored by the appointment of R. W. Charles L. Oxnard as District Deputy Grand Master for the Arlington Sixth Masonic District for the years 1937 and 1938. (The Sixth Masonic District was divided into the Arlington Sixth and the Somerville Sixth Districts in 1927.) He was assisted by Wor. Daniel W. Boynton as District Deputy Grand Marshal and by Wor. Dwight W. Robb of Sagamore Lodge as District Deputy Grand Secretary. R. W. George Emery Green, a Charter Member of Samuel Crocker Lawrence Lodge, its Secretary for 14 years, Master of Mount Hermon Lodge in 1921 and 1922, served as Grand Lecturer of the Grand Lodge of Massachusetts for 25 years from 1930 to 1954. He was Grand Representative for the Grand Lodge of New Mexico from 1949 until he laid down the working tools of the Craft in 1960 to enter the Celestial Lodge above. It is interesting to learn from the minutes of Samuel Crocker Lawrence Lodge that R. W. Roger A. Vint was installed as Master of Samuel Crocker Lawrence Lodge in December 1938 by the Most Worshipful Grand Master, Joseph Earl Perry. R. W. Bro. Vint was then serving as his private secretary, he having been employed in the office of the Grand Master since 1927 until his retirement in 1962 and most of that time as secretary to each incumbent Grand Master. R. W. Bro. Vint has been Grand Representative for the Grand Lodge of Manitoba, Canada, since 1950. Samuel Crocker Lawrence Lodge was honored to have Wor. Winfield S. Fuller serve as the Master of the Thirteenth Lodge of Instruction for the years 1958-1959. Once again Samuel Crocker Lawrence Lodge was honored by the appointment of R.W. Winthrop S. Polsey as District Deputy Grand Master for the Arlington Sixth Masonic District for the years 1959-1960. He was assisted by Wor. Bernard L. Cook as District Deputy Grand Marshal and Wor. Raymond A. Alden as District Deputy Grand Secretary. R. W. Bro. Polsey previously served as Junior Grand Deacon of the Grand Lodge of Massachusetts in 1955. Samuel Crocker Lawrence Lodge is honored to have Wor. Arnold R. Carlson serving as the Presiding Master of the Thirteenth Lodge of Instruction. The smooth running of a Lodge depends to a great extent upon the faithfulness of its Secretaries and all have served well. The finances of our Lodge have been well cared for and handled wisely by our Treasurers. The Chaplains of a Lodge conduct the devotions of a Lodge and administer to the spiritual needs of the brethren. of our rites as the Worshipful Master shall direct. The Organist of a Lodge conducts the musical services of a Lodge and the harmony over which he presides supports every gentle and ennobling emotion of the soul. The Tyler's duty is to guard against the approach of cowans and eavesdroppers and to suffer none to pass or repass but such as are duly qualified. On Thursday evening, June 24, 1920, a group of forty-six Masons met in the Masonic apartments of Mount Hermon Lodge, which at the time was located on the second floor above the old Boston and Maine Railroad Station on Main Street in Medford Square. Their purpose was to take the initial steps to form a second Masonic Lodge in Medford Square. The presiding Master of Mount Herman Lodge, Wor. Berton Guy Alice, was presiding at this meeting . The honor of being elected the first Master of the new Lodge went to the Rt. Wor. Charles B. Durham, (Past Master of Mount Herman Lodge in 1906 and 1907). The new Lodge was named in memory of Samuel Crocker Lawrence. The minutes of that meeting stated that General Samuel Crocker Lawrence was one of Medford's most distinguished sons, and one who has been found worthy to receive all the honors of Freemasonry that could be bestowed upon a craftsman in the United States of America. General Lawrence was internationally known and was recognized as having gathered together the finest Masonic Libraries in the world at that time. On June 26, 1920, with the confirmation of the Grand Lodge of Massachusetts, a warrant was issued to Rt. Wor. Daniel W. Lawrence, and seventy-five others, to form Samuel Crocker Lawrence Lodge in Medford. Daniel W. Lawrence was the eldest brother of Samuel Crocker Lawrence. On Tuesday, November 9, 1920, a meeting of the Charter Members was held at the Masonic Apartments for the purpose of the Institution of Samuel Crocker Lawrence Lodge. Rt. Wor. Charles H. Miles, District Deputy Grand Master for the 6th Masonic District, assisted by Wor. Arthur D. Stone, District Deputy Grand Marshal, performed the service of the Installation by installing Rt. Wor. Charles B. Durham, as Master of Samuel Crocker Lawrence Lodge, and similarly installing the other Officers. The 1st Communication of Samuel Crocker Lawrence Lodge under the dispensation was held on Tuesday, December 14, 1920. The first work performed by the Officers of the Lodge was to confer the Entered Apprentice Degree upon four candidates. The 9th Communication of Samuel Crocker Lawrence Lodge was held on Wednesday, June 22, 1921, for the purpose of Constituting Samuel Crocker Lawrence Lodge. Most Worshipful Arthur D. Prince, Grand Master of the Grand Lodge of Massachusetts, accompanied by his Suite of Grand Lodge Officers was received by the Lodge. The Most Worshipful Grand Master performed the Ceremony of Constituting Samuel Crocker Lawrence Lodge. Following this, the Most Worshipful Grand Master installed Rt. Wor. Charles B. Durham as Master. The remaining officers were installed by various other Officers of the Grand Lodge. The minutes of the 20th Communication of Samuel Crocker Lawrence Lodge, May 9, 1922, records that a gift of a Gavel, Warden's Truncheon, and Marshal's Baton were presented to Samuel Crocker Lawrence Lodge, by the Mystic Royal Arch Chapter. They were presented by Bro. Charles H. Phinney, Junior Deacon of Samuel Crocker Lawrence Lodge, who at that time was serving as the excellent High Priest of the Chapter. The minutes of the 21st Communication, May 23, 1922, acknowledges the receipt of a gift of the Holy Bible, Square and Compasses from Mount Herman Lodge. They are currently in use upon the Altar of Samuel Crocker Lawrence Lodge at this time. The minutes of the 33rd Communication, April 10, 1923, refer to the receipt of various beautiful gifts of the regalia presented to the Lodge by Mrs. Samuel Crocker Lawrence. If you look at the Deacon's and Steward's rods with engraved silver tips you will see some of the gifts of Mrs. Samuel Crocker Lawrence that are currently used in the Lodge. The 61st Communication of the Samuel Crocker Lawrence Lodge was held on November 17, 1925, in the new Masonic Hall at 24 High Street, which is the upstairs apartments of Cradock's Apothecary. It also marked the 5th Anniversary of the Lodge. Samuel Crocker Lawrence Lodge has always been an active and friendly Lodge. Many of the members have been well-known throughout Medford in civic, community, business, and church activities. The Officers and members, with the combined contribution of their work for the betterment of the Lodge and the community, deserve commendation. It is impossible to credit each individual for his effort, but the following are those who have served Masonry either by their years of service as an Officer or have served the Grand Lodge of Massachusetts, beyond the portals of Samuel Crocker Lawrence Lodge. The first Master of Samuel Crocker Lawrence Lodge, Rt. Wor. Charles B. Durham, was District Deputy Grand Master of the 6th Masonic District in 1908, many years before the Institution of the Lodge. The second Master of the Lodge was Rt. Wor. Fred L. Moses, who was presiding Master of Soley Lodge at the time of the Institution of our Lodge, and served as District Deputy in 1923 and 1924. Assisting him as District Deputy Grand Marshal was Wor. Edward B. Ladd of Soley Lodge and the District Deputy Grand Secretary, Charles E. Cole, of Soley Lodge. Rt. Wor. Bro. Moses later served in 1927, as Junior Grand Warden of the Grand Lodge of Massachusetts. Samuel Crocker Lawrence Lodge was again honored by an appointment of Rt. Wor. Charles L. Oxnard as District Deputy Grand Master for the Arlington 6th Masonic District for the years 1937 and 1938. The 6th Masonic District was divided into the Arlington 6th andSomerville 6th in 1927. Rt. Wor. George Emery Green, a Charter Member of the Lodge and it's Secretary for 14 years, was also Master of Mount Hermon Lodge in 1921 and 1922, and served as Grand Lecturer of the Grand Lodge of Massachusetts for 25 years from 1930 to 1954. He was Grand Representative for the Grand Lodge of New Mexico from 1949 until he laid down the tools of the Craft in 1960 and entered the Celestial Lodge. sentative of the Grand Lodge of Manitoba, Canada, from 1950 until his untimely death. Samuel Crocker Lawrence Lodge was honored to have Wor. Winfield S. Fuller as Master of the 13th Lodge of Instruction in 1957-1958. Since that time, there have been four additional Masters: Wor. Arnold R. Carlson, Wor. James Roberts, Wor. Ilidio M. Silva, and Wor. John R. Cannon. Also, we have had five District Deputies, starting with Rt. Wor. Charles B. Durham, Rt. Wor. Fred L. Moses, Rt. Wor. Charles L. Oxnard, Rt. Wor. Winthrop S. Polsey, and Rt. Wor. C. Edward Estes. On Monday, May 11, 1970, at 30 High Street, Medford, in the new apartments above Cradock's Apothecary, Most Worshipful Herbert H. Jaynes, Grand Master, was received by Rt. Wor. Winthrop S. Polsey as Chairman, and Wor. C. Edward Estes as Master of the Lodge on the special occasion of the 50th Anniversary of the Lodge. Samuel Crocker Lawrence Lodge has had seven Secretaries from the year 1920 to present. The Lodge has had nineteen 50-year members, of which eight are still with us at the present time. We are also proud to announce that Wor. Steve J. Gogolos, Past Grand Steward, and Fred L. Moses, Past Junior Grand Warden were also members of Samuel Crocker Lawrence Lodge. March 16, 1971, a Fraternal visitation was made by the District Deputy, who at that time was Rt. Wor. Robert Johnston, his Marshal and his Secretary. We note that his Marshal was Wor. William G. Manchester and his Secretary was Gilbert R. Foster. The next visit to the Lodge was by Rt. Wor. Charles L. Oxnard. The purpose of the visit was to present a 50 year Veterans Medal to Rt. Wor. Roger A. Vint. After receiving the Veterans Medal, Rt. Wor Charles Sergeant presented Roger with a gift from his many friends in Major General Henry Knox Lodge. Rt. Wor. Oxnard spent several minutes reminiscing about the many years they had spent together in the Grand Lodge. September 13, 1975, the Installation of the officers of Samuel Crocker Lawrence Lodge was done by Most Worshipful Stanley F. Maxwell accompanied by Rt. Wor. Brenton E. Tyler, his Grand Marshal. He was escorted to the East by Past Master Rt. Wor. Charles L. Oxnard who was Chairman of the Committee. The Grand Master installed Thomas M. Leach as Master, W. Clinton Myers as Senior Warden, and Wor. Stanley Winchester as Junior Warden. He then turned it over to the Grand Lodge Officers to install the remaining Officers. On September 10, 1977, the first meeting was held in the new armory on 92 High Street when Samuel Crocker Lawrence Lodge was moved from the Masonic Apartments at 30 High Street. On Tuesday, October 17, 1979, the Grand Master, Most Worshipful Arthur H. Melanson made a visit to Samuel Crocker Lawrence Lodge. The Masters of both Samuel Crocker Lawrence Lodge and Mystic Valley Lodge were introduced by Wor. Winthrop S. Polsey to the Grand Master. The Charter and Seal of Mystic Valley Lodge were turned over to the Grand Lodge. The other property of the Lodge was turned over to Samuel Crocker Lawrence Lodge. The Grand Master gave a brief talk about the merger and introduced Most Worshipful Herbert H. Jaynes, Past Grand Master; Most Worshipful Whitfield W. Johnson, Past Grand Master; Rt. Wor. Robert H. Stevens, Senior Grand Warden; and Rt. Wor. Edgar W. Darling, all of whom had a brief but interesting talk. Samuel Crocker Lawrence Lodge, A. F. & A. M., was constituted at a largely attended gathering of the craft in Masonic Hall, Malden, Mass., Thursday evening, June 23, with a notable gathering of members and officials from this and nearby cities and towns. Following the constitution dinner the exercises were held, under the direction of Grand Master Arthur D. Prince and suite of grand officers. The Weber Quartet furnished music. There are 81 charter members and many members were admitted while the lodge was under dispensation. The officers installed are: Worshipful Master, Charles B. Dunham; Senior Warden, Fred L. Moses; Junior Warden, Richard F. Churchill; Treasurer, Ernest B. Moore; Secretary, Walter J. Rhodes; Chaplain, Rev. Louis C. Dethlefs; Marshal, John H. Neill; Senior Deacon, Lawrence B. Moore; Junior Deacon, Philip A. Jerguson; Senior Steward, Charles H. Phinney; Junior Steward, William G. Knight; Inside Sentinel, George L. Batchelder, Jr.; Organist, Melville M. Blake; Tyler, Harry J. Newhall. Grand Chaplain; Francis L. Beal, D. D., Grand Chaplain; Frederick A. Leavitt, Senior Grand Deacon; Frank L. Simpson, Junior Grand Deacon; Franklin C. Jillson, Senior Grand Steward; Guy C. Willis, Junior Grand Steward; Frank H. Hilton, Grand Sword Bearer; George W. Chester, Grand Tylsr; Arthur D. Stone, P. D. D. G. M.
Other guests present included Walter I. Fuller, Master, Somerville Lodge; Alexander F. Wood, Master, Mt. Horeb Lodge, Woburn; Amasa Harrington, Master, Mystic Valley Lodge, Winchester: Harry H. Askton, Master, John Abbot Lodge, Somerville; Fred L. Moses, Master, Soley Lodge, Somerville; Raymond Merrill, Master, Wm. Parkman Lodge, Winchester; Edward T. Erickson, Master, Hiram Lodge, Arlington; Ralph P. Jones, Master, Sagamore Lodge, West Medford; George Emery Green, Master, Mt. Hermon Lodge. Medford; Walter Traquair, Master, Medford Council R. and S. M.; Charles H. Phinney, High Priest, Mystic R. A. Chapter; Loren A. Gordon, Senior Warden, Mt. Hermon Lodge; F. Irving Weston, Junior Warden, Mt. Hermon Lodge; Rev. Thomas C. Richards, Chaplain, Mt. Hermon Lodge. On September 5. 1995, Samuel Crocker Lawrence Lodge of Somerville celebrated its 75th Anniversary. M. W. David W. Lovering was present with a distinguished suite to witness the celebration and participate in the Installation of Officers. Wor. Herbert V. Canfield, who is 92 years young, was installed as Master by the Aleppo Temple Guard Unit. Bro. Canfield is a member of the Shrine Guard Unit and the Massachusetts Consistory Guard. The Grand Master presented Wor. Ronald Pratt with a 50-Year Past Master's Certificate and pin. He was Master of the Lodge in 1942 and 1943. He traveled from Florida with his wife and many friends. The books in the Samuel Crocker Lawrence Library in Grand Lodge were donated by M. W. Samuel Crocker Lawrence, Grand Master from 1881 to 1883, and are available for loan to the Brethren. 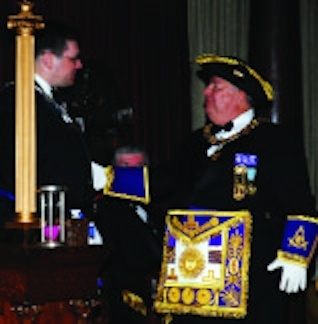 Grand Master Pageau installs Wor. Frank J. Kautz II at the newly reconstituted Samuel Crocker Lawrence Lodge. In 1921, brethren in Medford came together to create Samuel Crocker Lawrence Lodge (SCL). This lodge was both prosperous and active in Medford for 75 years. Then, for reasons beyond its control, SCL was forced to move out of its home city. Like so many lodges in this situation, SCL slowly began to decline, with the same few past masters, year in and year out, taking the same chairs. Eventually, SCL’s members decided that it was far better to merge with another lodge than to go completely dark. For many lodges, that would be the end of this story, however, fortunately for SCL it was not. In late 2009, Rt. Wor. Ken Sprague, District Deputy Grand Master of the 4th District, noticed that a large number of Medford candidates were being raised at Converse, his home lodge. Rt. Wor. Bro. Sprague approached the Grand Master about the possibility of starting a new lodge in Medford. He told the Grand Master that Medford was a strong, family-based community, and that there were probably more men who would join our fraternity if there was a lodge based in Medford. The Grand Master gave Rt. Wor. Bro. Sprague the encouragement he needed to start talking about the idea. Bro. Sprague noted also that Mt. Hermon Lodge, based in Woburn, was one of the original Medford lodges. He contacted them to make sure that they would not have any concern if a new lodge was formed in Medford. It was then that the idea of reconstituting SCL Lodge, rather than starting a new lodge from scratch, came about. Bro. Sprague, now energized by the idea of reconstituting SCL Lodge, contacted several former members of SCL and arranged for them to send a petition to Grand Lodge requesting the return of the original charter. Space for the reconstituted lodge was found at the Medford Elks Building on Washington Street in Medford. Brothers from the 3rd, 4th, and 13th Districts quickly volunteered to be officers for SCL, but a master was still needed. The first year of the reconstituted Samuel Crocker Lawrence Lodge was dedicated to the memory of Rt. Wor. Bro. Estes. The curator for this page is Brother Alan Jones. Please direct informational updates and questions to him. This page was last modified on 24 September 2018, at 14:57. This page has been accessed 23,854 times.